When my husband and I first arrived in Phnom Penh in 2002, my first impression was that it was full of history and culture but lacked the luxuries, excitement, and comfort of modern and urban life. At that time, we’d go home from work at five, have dinner and by six, we’d be staring at each other and wondering what to do. More than five years later, Phnom Penh has developed into a lively, bustling urban city. There are so many restaurants, bars, hotels, and tourist places. At night, Phnom Penh is very bright and full of life. Most of my favorite channels are available on cable, and we actually have high-speed Internet in our home. At the same time, Phnom Penh remains quaint and true to its historical and cultural past, with its wide boulevards, well-manicured parks, river walks, museums, galleries, and cultural shows. There are accommodations for all budgets in Phnom Penh – from the $5-$10 guest houses to the swankier first class hotels like Intercontinental Hotel and the Raffles Hotel Le Royale. There are also those in between like La Parranda, Imperial Garden Hotel, the Sunway Hotel and the Cambodiana Hotel. You can’t hail a taxi on the street in Phnom Penh. You have to arrange for a taxi or a tuktuk from your hotel. I don’t recommend riding a moto dohp (motorcycle taxi) due to safety reasons although the more adventurous foreigners often ride on these. It’s easy enough to get to the places you want to go to if you arrange with your hotel to talk to the driver beforehand. I got my first culture shock in Phnom Penh when we were driving around and almost ran smack into Sam Bo, the huge Phnom Penh elephant, who was ambling along the boulevard. But Sam Bo wasn’t the only danger on the streets. Traffic here in Phnom Penh remains one of the major conversation topics of expats. Besides elephants, one has to navigate the roads of Phnom Penh with cars, SUVs, swarms of motorcycles, tuktuks, cyclos, trucks, pedestrians, oxcarts, and even roller-bladers! Foreigners are treated with respect in Phnom Penh. Locals are fast learning how to speak in English making communication around the city easier. A lot of foreigners are looked up to by Cambodians, as they are perceived as their partners in Cambodia’s development and recovery from the ravages of war. Of course, when one goes to Cambodia, one has to go to Siem Reap (about four hours drive from Phnom Penh) to visit the Angkor Wat and the other ancient temples. But the capital Phnom Penh also has a lot to offer on its own. One of my favorite tourist places in Phnom Penh is the Royal Palace, which in my opinion could rival the palaces in other Asian countries as well as in Europe. Entry Fees: $3.00 per adult. Visitors will be charged $1.00 to bring their cameras inside. And of course, to explore Cambodia’s dark history during the Khmer Rouge era, I could also bring visitors to the Toul Sleng Genocide Museum and the Killing Fields. I always have to warn my guests beforehand of the impending gloom which usually follow visits to these sites which are witness to the horrific and brutal period of the Khmer Rouge regime. Opening Hours: Open everyday, including holidays, 8AM-5PM. Closed for lunch. One place which most of my visitors always enjoy is the Toul Tompong or the Russian Market where one could buy Cambodian souvenirs such as semi-precious stones, silk, silver, and wood products. Garments is one of Cambodia’s major exports and one could also buy authentic branded clothes such as Gap, Tommy Hilfiger, Burberry, etc. from this market at rock-bottom prices! It’s easy enough to find Cambodian fare anywhere but we usually bring out guests to either Malis, Khmer Surin, or Sugar Palm. The Mekong River and the Tonle Sap Lake have the most abundant variety of fresh water species in the world and you should try their specialties like the amok fish and the river prawn. What’s noticeable with a small city like Phnom Penh is that when it comes to international fare, they are pretty authentic. When you go to a Vietnamese restaurant, your pho is cooked by a Vietnamese. When you go to a Japanese restaurant, a real Japanese chef would roll your sushi. When you go to a Lebanese restaurant, the Lebanese chef would serve you your hummus and taboulehs. When you go to an Italian restaurant, an Italian would cook your pizza the way they do in Rome. And when you go to a French restaurant, the French chef would serve you like a real French gourmet. You can rent a car or taxi for the whole day for around $25 to $35. But you may also get a tuktuk (motorcycle trailer) for only $10 to $15. For food and lodging, Phnom Penh is the sort of city where there is something available for every budget. If you’re going shopping, if you have a hundred dollars, it would take you far and if you spend all of it, you would need to buy another suitcase to carry all your purchases back home! 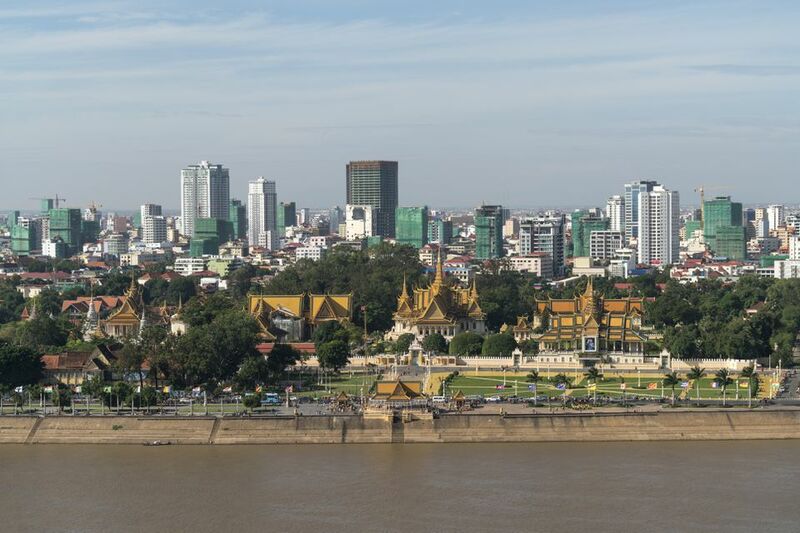 Cambodia’s gaping contrasts are evident in Phnom Penh – the city introduces you to the magnificence of the great Angkor civilization as well as the horrors of the genocidal Khmer Rouge regime. The city sits at the confluence of the region’s three great rivers – the Mekong, the Tonle Sap, and the Tonle Bassac. It is the capital of Cambodia and offers a wide range of cultural and historical attractions. It is also the gateway to the land of Angkor in Siem Reap, as well as the pristine beaches in the south (Sihanoukville and Kep). Phnom Penh remains one of the few cities where one could just stroll leisurely in the park, fly a kite, enjoy the wind through your hair, watch the river flow along the bank, nurse a cup of coffee for half a day in one of the al fresco bars by the riverside, or stare wondrously at the colored fountain at the Independence Monument for hours. Toe is an expatriate based in Phnom Penh.